Today’s messy situation is from Anna, a working mom of two. “Hi Davonne! As you can see from the photos, I desperately need your help! My beautiful (when you can see it) island is my biggest unorganized problem! 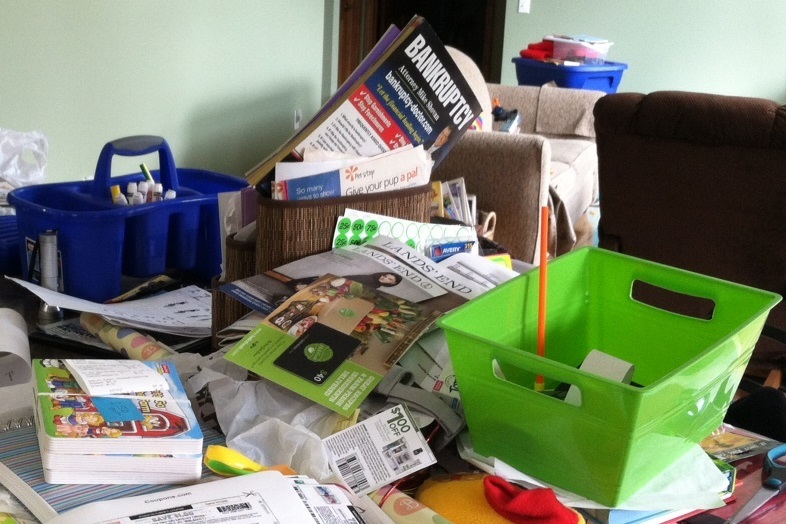 It is the catch-all for everything…mail, school papers, receipts, anything that needs up out of reach from my 2 year old, anything found around the house that needs put away in another room, etc. Anna, with both you and your husband working full time, plus two little boys, you really have your hands full! I definitely think you can get your counters under control. First of all, toss, toss, toss! It seems like you may be reorganizing some of your clutter – you put it away, and then it somehow keeps reappearing and cluttering up the counters. 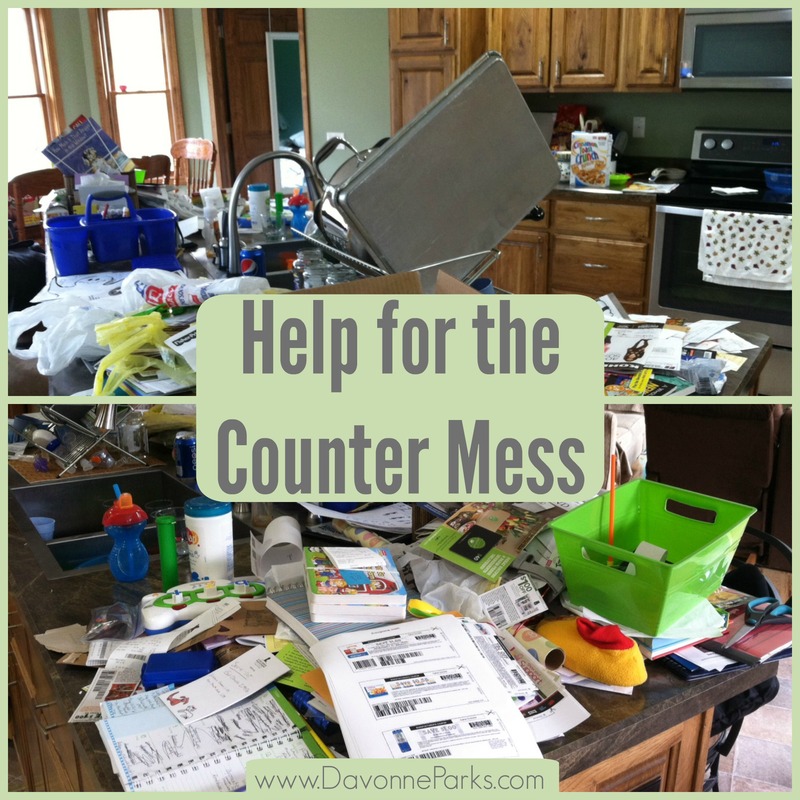 Get rid of anything on those counters that you can instead of just reorganizing the mess! Second, it would help if you have a good incoming paper system. Consider putting a trashcan beside your door or next to your counters. Throw things away before setting anything down. Next, you’ll probably want to make good use of the green and blue bins that are already on the counter – those are great containers for setting a natural limit. What I mean by this is that if you have some items that end up getting left on the counter, that’s fine sometimes. Just put those things in a designated container, but when the container’s full, then it’s full and it needs to be cleaned out. It’ll also help if you think about how you’ll feel in five minutes instead of focusing on how you feel right now. For example, when I come home with a bunch of groceries, I’m usually really tired. I used to just put the cold stuff away and leave everything else out all over the kitchen. Then my family had to look at the bags, step over them, and dig through them for food until I got around to putting the things away. So, now when I come home from the store, I’ll tell myself, “You can do this, Davonne. It’ll feel so great to have these groceries put away. You can power through for just five minutes.” Focusing on how great it’ll feel to have the simple job finished, instead of thinking about how much I just want to sit on the couch, helps me to quickly get the job done so I can relax without being surrounded by a mess! Finally, remember to just do something. If your counter tops start piling up again, don’t feel like you can’t make progress until you have time to clear everything away. Just pick one pile or one corner, and do that. Then when you have a few more minutes, clear another little pile. Keep making progress and give yourself grace when you don’t do a perfect job! Bonus tip: I don’t usually recommend cheating when you’re trying to get rid of clutter, but I confessed about my laundry-basket cheat cleaning method here, so check that out if you’d like. Keep your counters clean as often as possible, but consider occasionally “cheating” when you’re having an extra busy week and need a quick-fix. I hope this helps you, Anna! Please let me know if you have any more questions about your counters, and don’t forget to send in after photos when you’re finished clearing them!